Aizawl, Nov 5 : In a remarkable achievement, Mizoram has been awarded ‘the best performing state in investment’, by India Today as a result of its study on Indian States. The achievement award was received by Mizoram chief minister Lal Thanhawla today on the occasion of the 10th India Today Chief Ministers Conclave, held at Hyatt Regency, New Delhi, where other awards were also being given. Speaking on the occasion of India Today Chief Ministers Conclave, Lal Thanhawla expressed his gratitude for being able to participate at the 10th India Today Conclave of Chief Ministers, and also expressed his heartfelt thankfulness towards the India Today Group for conferring such an esteemed award upon Mizoram. Lalthanhawla said that despite conducting several conferences, seminars and debates in order to enhance the progress and efficient governance but liitle development and progress could be seen in the North Eastern states. The North East is a unique place, with its inhabitants of varied and different cultures, and it is different from other parts of India in terms of its geography and topography and as such it requires a special project and even for its expenditure it requires 25% more than the other states, Lalthanhawla said He then admitted that when comes to developmental front, most of the North East states are lagging behind others. 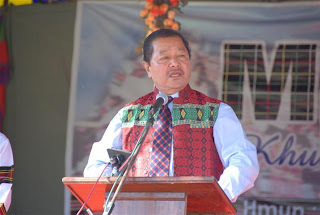 The Mizoram Chief Minister also mentioned that Mizoram government is presently carrying out the development programme New Land Use Policy (NLUP) which is for the entire population in the state. He added that NLUP is not only to create a sustainable economy but also a programme for proper utilization of the natural resources of the land, a programme to end deforestation, to abandon traditional jhuming cultivation, and to explore the natural wealth of the land.